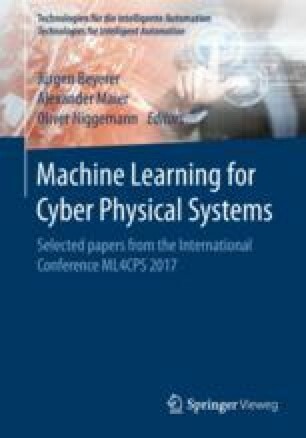 Learned Abstraction: Knowledge Based Concept Learning for Cyber Physical Systems. Machine learning techniques have a huge potential to support humans, some impressive results are still achieved, such as AlphaGo. Until now the results are on a sub-symbolic level which is hard to interpret for humans, because we think symbolically. Today, the mapping is typically static which does not satisfy the needs for fast changing CPSs which prohibit the usage of the full machine learning potential. To tackle this challenge, this paper introduces a knowledge based approach of an automatic mapping between the sub-symbolic results of algorithms and their symbolic representation. Clustering is used to detect groups of similar data points which are interpreted as concepts. The information of the clusters are extracted and further classied with the help of an ontology which infers the current operational state. Data from wind turbines is used to evaluate the approach. The achieved results are promising, the system can identify the operational state without an explicit mapping. The work was supported by the German Federal Ministry of Education and Research (BMBF) under the projects “Semantics4Automation” (funding code: 03FH020I3) and “Provenance Analytics” (funding code: 03PSIPT5B).